In a historic sweep of battleground states that blindsided pollsters and analysts, Republican presidential nominee Donald Trump claimed victory early Wednesday — shocking the political establishment and becoming the first Republican to win Wisconsin in a presidential election since 1984. The unprecedented Trump victory led to a GOP wave in Wisconsin, with U.S. Sen. Ron Johnson winning his re-election bid by even wider margins than Trump and state Republicans poised to expand their majorities in both chambers of the state Legislature. In a victory speech that was more mellow than his usual stump speech rhetoric, Trump struck a conciliatory tone as he told supporters that Democrat Hillary Clinton called him to concede. “The forgotten men and women of our country will be forgotten no longer,” Trump told a hall of cheering supporters in Manhattan. Clinton did not make a concession speech. Pre-election polling consistently had Clinton leading the country and the state, and the Democratic nominee didn’t make a single stop in Wisconsin after losing in the state primaries in April. The latest Marquette University Law School poll, for example, had Clinton with a 46 percent to 40 percent lead over Trump. 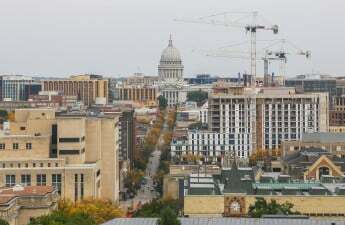 Barry Burden, a University of Wisconsin political science professor, said it remains unclear how the polls both here and nationally failed to predict a Trump victory. Trump pulled major wins in Florida and Ohio, setting him on a path to the 270 electoral college votes necessary to claim the presidency relatively early in the night. The rust belt states that Trump hailed as strongholds for his campaign despite lackluster polls, including Wisconsin and Michigan, were too close to call until early Wednesday morning. With 99 percent of precincts reporting, Trump remained two points ahead in Wisconsin. In Dane County, Trump took just 23 percent of the vote compared with Clinton’s 70 percent, but a landslide in the state’s second most populous county was not enough to counter the Republican sweep of rural areas. Neither was the vote in heavily-Democratic Milwaukee County, where 66 percent of voters supported Clinton. Johnson, meanwhile, outperformed Trump in the state with his five-point victory over Democratic challenger Russ Feingold, whom Johnson had ousted from the Senate in 2010. The Oshkosh Republican was one in a stream of Senate GOP incumbents to keep their seats, dashing Democrats’ hopes of snagging a majority in the chamber. Republicans swept the state Legislature, boosting their majorities in both the Senate and the Assembly. Senate Minority Leader Jennifer Shilling, D-La Crosse, was up by only dozens of votes in her race against former Sen. Dan Kapanke and claimed victory after 3:30 a.m. Wednesday. Gov. Scott Walker, who lost against Trump in the Republican primaries but supported him in the general election, said leaders ought to look to Wisconsin for reform approaches. 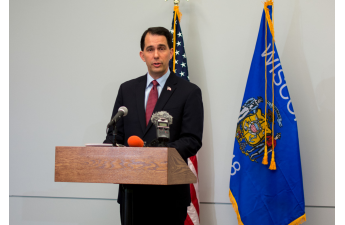 “Tonight is a win for taxpayers and a win for America,” Walker said. Michael Brasford, the chair of the Dane County Democratic Party, said at a Democratic watch party at Plan B that the future of the country and the world is dependent on a very strong opposition to Trump. “What I think we need to do is starting tomorrow, we’re going to start fighting very hard to take this country back,” Brasford said. College Republicans celebrated at Brickhouse BBQ as Trump won state after state. Though students had to leave as the bar closed at around 11 p.m., chairman Alex Walker, the governor’s son, said he was confident and optimistic about the outcome. Walker said he was pleased with the high turnout of students for the viewing party. He said even if Clinton were to win the race, they would all still be excited about the results of the U.S. Senate and House elections. Were Republicans to take the White House as well, Alex Walker said Trump would initially face challenges bringing people together. 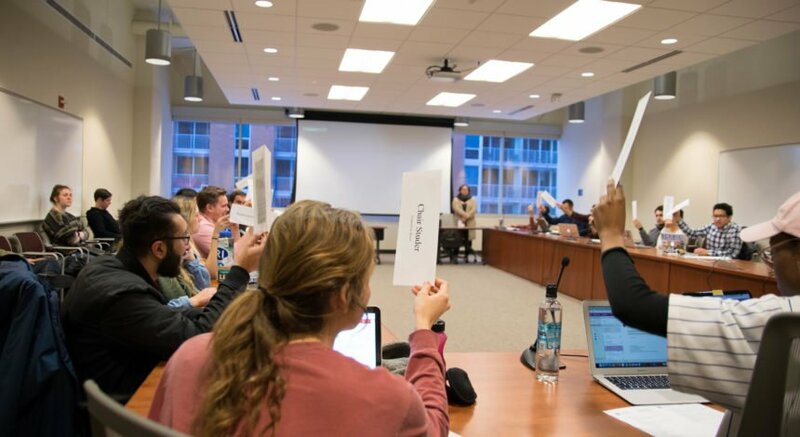 Some College Republicans were surprised by the results, including Emelia Rohl. She said she did not initially think the race would be so close or that Trump would ultimately win. Confidence at the event grew throughout the evening, with support rising to a deafening cheer when Fox News first reported Johnson made gains against Feingold. While Feingold’s watch party at the Marriott Madison West in Middleton was festive early in the evening, it quickly turned somber shortly after he conceded to Johnson. Early on, most national pundits didn’t give Johnson high chances. But the polls in recent weeks predicted a tight race as Feingold looked to reclaim his Senate seat. Feingold seemed jarred as he took the stage, alluding to early indications of a Trump presidency. Going forward, Feingold said America needs to come together as a country to heal. Acknowledging that his own campaign had run its course, Feingold shifted hopes of repair onto the younger generation, like the individuals who worked on his campaign. “It is up to you now,” he told the crowd of supporters. UW students Katie Biester and Katie Martin have been working for the Clinton campaign since September. Both, fighting back tears, said they were genuinely scared for what kind of future lies ahead. The greatest fear she had, Martin said, was for her Muslim, Latino and black friends. Martin also expressed fear for her little sister, who she said must now grow up in a climate where the president has made demeaning remarks against women. By allowing Trump to assume the presidency, Biester said this sends a message to women that their experiences with sexism and misogyny are not real. “This shows us our pain, suffering and everything we’ve been through means nothing,” Biester said. With the current sexual assault case on campus, UW alumna Jamie Lilburn said she is concerned what kind of message Trump’s win sends to men. Since Trump has pending sexual assault allegations against him, Lilburn said he demonstrates to others that there are no consequences, and you can do what you want — like become president. 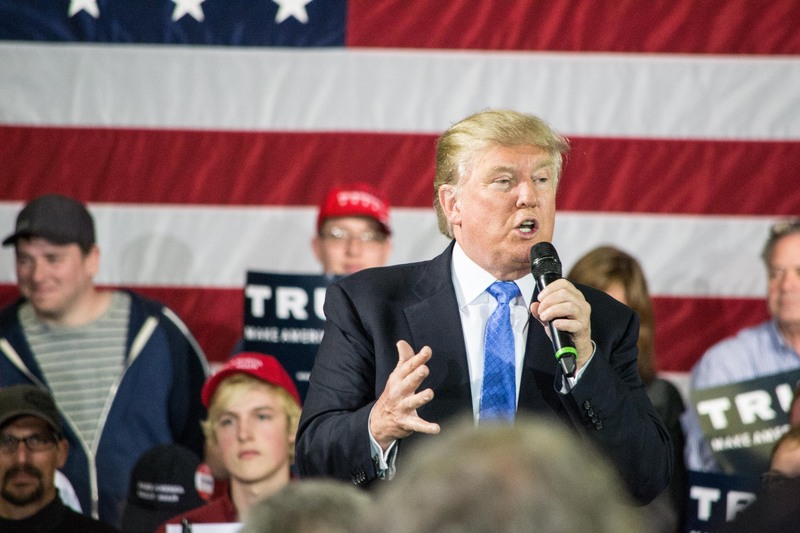 While UW student Connor Buchholz disagrees with the comments Trump made against women, he thinks it’s important to note that Clinton defended her husband in a similar situation. “I think it’s unfair to throw one side under the bus and not the other,” Buchholz said. Looking forward, Burden, the political science professor, said Democrats will have to seriously reevaluate their strategy in Wisconsin if they hope to win during the next cycle. He said that as it stands, Democrats cannot afford to continue their strategy of focusing on city centers instead of rural areas. Trump said in Manhattan early Wednesday morning, as president, he would work to restore the United States to its former glory. Maija Inveiss contributed to the reporting of this article.